Why do we desire to rush the holiday season? It seems that no sooner is Halloween over that the Christmas decorations start to appear in the stores. I noticed the other day that the Town I live in has started to put up their holiday decorations. I call them holiday decorations because there is not one that would signify the reason for season, but I digress. For the Orthodox November 15th begins the period known as St. Philip’s fast or the Nativity Fast, or even Christmas Lent. I have spoken of this before but the Christmas Season does not begin until December 24th! It would be like running around yelling “CHRIST IS RISEN” during Lent, we just don’t do it. Hallmark, and the other retail establishments, have brainwashed us that we have to get into debit, as a way to show how much we love each other, and we have to do it as soon as possible. This has now started to spill over into Thanksgiving. This has been coming for some time now but it seems to have arrived. Nothing is sacred any longer. The holidays are supposed to be about family and friends and the Thanksgiving Holiday is supposed to be about giving thanks for what we have not running over someone to get what we don’t need or what will be broken in 2 weeks. It may seem like a small thing and just like Sunday, Thanksgiving has become just another day, but the madness has to stop and it needs to stop soon. If we shop on Thanksgiving, or Sunday for that matter, we require other people to have to leave their families and their table so we can indulge in our materialistic ways. The retail outlets will require their employees to work, to satisfy your craving and lust for the latest gadget, and if they do not work they will be fired. Stay home and save someone’s job! In his weekly bulletin from St. Nicholas Orthodox Church in Shrewsbury Massachusetts, Fr. Nicholas Apostola wrote this and I think it sums up my thoughts on the madness of shopping on Thanksgiving. PREPARE FOR CHRISTMAS BY FASTING! One of the most critical ways you might what to prepare for Christmas is not only by fasting from food, but also from shopping, — or at least choosing when to shop. We are losing one of the VERY last shared holidays. 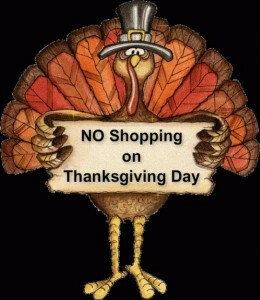 Most large retailers have decided to open on Thanksgiving Day! Goodbye to family gatherings. Goodbye to simple conversation around the turkey table. Goodbye to high school football rivalries. We are now given one focus: shopping, shopping, shopping. You have a say in this. Don’t shop on Thanksgiving. Talk to your family and friends and have them stop as well. This is a moment for us to act and keep our society sane.